Starting today, every Monday will be dedicated to meditating on and memorizing scripture. 29 Let no corrupt word proceed out of your mouth, but what is good for necessary edification, that it may impart grace to the hearers. 30 And do not grieve the Holy Spirit of God, by whom you were sealed for the day of redemption. 31 Let all bitterness, wrath, anger, clamor, and evil speaking be put away from you, with all malice. 32 And be kind to one another, tenderhearted, forgiving one another, even as God in Christ forgave you. Have you been having a hard time getting on Facebook? Does the constant bombardment of political posts and memes insight feeling of anger and bitterness? Well, if so, you are not alone. But let me ask you this, are your Facebook posts and comments leaving others to feel angry, bitter, or resentful? I am usually one that jumps right into controversy. I am usually one of the first to defend my beliefs, but during this whole political season, God has not allowed me to post or comment much at all. This is one of the reasons I had to stop blogging for a time. I didn’t trust myself not to post things that would incite anger and frustrations in my brothers and sisters or non-believers. Yes, I want to defend my beliefs. Yes, I want others to see the truth. But, honestly, do we really think that is going to happen through Facebook? Without meaning to, I could quickly do more harm than good for my Jesus. Facebook memes can be funny (but only if they support your views), but more often than not, they can lead to one side feeling superior and the other feeling beat up (the name says it all…me..me). This my friends is not the way of Jesus. This is not easy, but it is a must. Some will argue that this scripture only applies to what we say to our brothers and sisters in Christ, but I believe how we speak to everyone indicates what is in our hearts. Bitter, angry words only lead to bitter, angry feelings on both sides. Yes, victory is on the side of the Christians, but we must be careful to not allow a spirit of superiority come over us and forget we are called to lead these people to Christ. If we speak unkind words because we are angry at what others are doing and saying (and yes they are doing and saying things that break my heart) then we are in danger of growing callous to the very people we are called to minister to. Romans 9:1-3 (NLT): With Christ as my witness, I speak with utter truthfulness. My conscience and the Holy Spirit confirm it. 2 My heart is filled with bitter sorrow and unending grief 3 for my people, my Jewish brothers and sisters. [a] I would be willing to be forever cursed—cut off from Christ!—if that would save them. If we allow our heart to be filled with anger and bitterness for those who don’t agree with us, attack our Jesus, etc., then we are giving Satan a foothold. Yes, I know there is more to Ephesians 4, and I am sure to discuss it in upcoming posts. 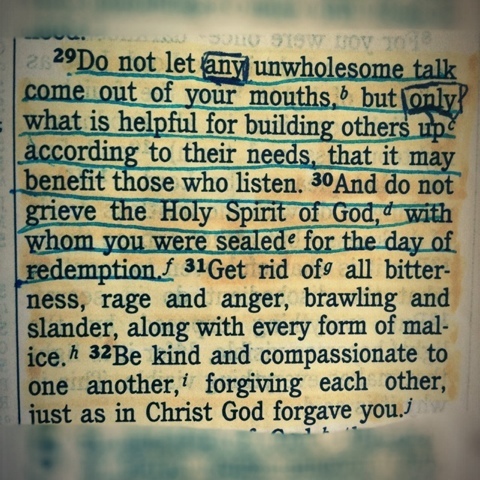 Please memorize Ephesians 4:29-32. Yes, I know it is a long one, but we can do it! Please come back tomorrow as I will finish up the short series Getting and Keeping a Godly Mindset.